I want, no I need to be able to print while on the road, and for that fact scan & copy while I am traveling. This project set out looking for a printer I can print to without ever hooking up to a PC to set up. I also had size requirements as the space is over the microwave. I found HP & Cannon that would fit and they are WIFI ready, but can they be put into service without a PC. I called both companies & spoke with technical support people. My questions didn't have exact answers. I have WIFI hotspot on my phone so I defaulted to asking about using my phone's WIFI to make the connection and print. 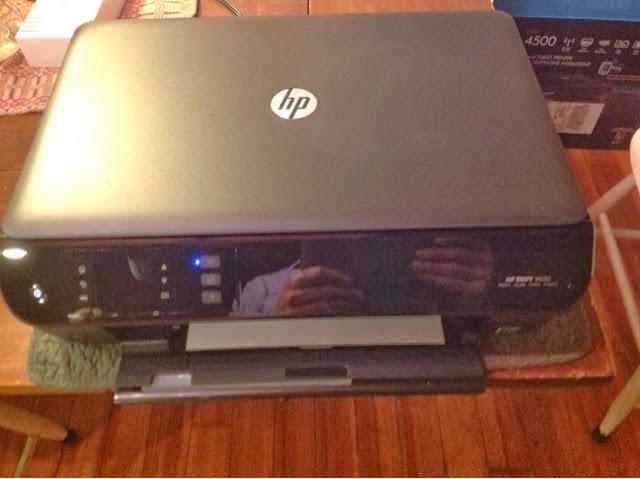 HP had the best answers so I decided to get this HP Envy 4500. The woman said it should work. It didn't give me great confidence. It came in the mail and I set it up and I didn't need a PC or to load the printer software. it also worked with my cell WIFI hotspot to print. What was more interesting is that you can connect to your WIFI Phone or Tablet direct without the hotspot as a router. All you need to do is unpack the printer and plug it in / install ink cartridges and make a direct connection from your devices direct through WIFI using the info from the printer screen. It can be secured with password or not. Then just print. Now why didn't the tech hotline for HP know this? Have visitors? Get one of these and set it up and they can print their own boarding passes.